I'm a fan of all things leather. No matter if it's shoes, belts or pen cases,... I love the organic and classy look and feel leather products have, and the fact that leather products get better with use. You just can't find the same character in fabric alternatives. That's not to diss on brands like Nock.Co or Rickshaw, who make really cool writing accessories in all sorts of materials except leather,... it's just a personal preference thing. 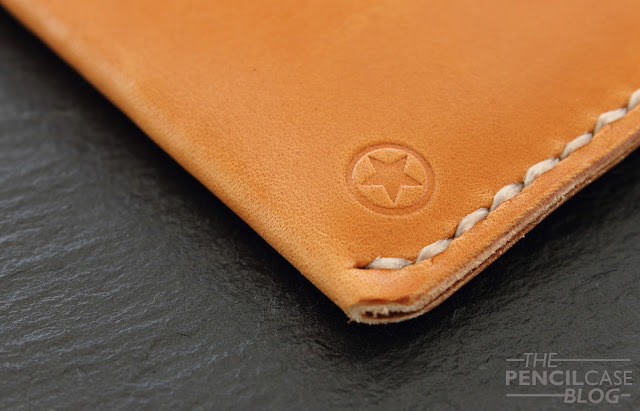 So when Keegan, founder of One Star Leather Goods, contacted me to see if I wanted to take a look at some of his handmade leather products, I didn't hesitate. Sure, there are a lot of 'artisanal' leather goods brands out there these days. But One Star is definitely up there with a solid reputation that they built over the years. Keegan gave me the choice of picking whatever I wanted for review, in retrospect he probably wished he had chosen for me, because I remember being quite indecisive for a while: A plethora of choices between models, finishes and leather types... I'm never good at making choices, so I asked Keegan for help multiple times! In the end, we agreed on an A5 size Leuchtturm notebook cover, and a couple pen sleeves in different leather types. Let's focus on the notebook cover first. One Star makes a couple different notebook covers. 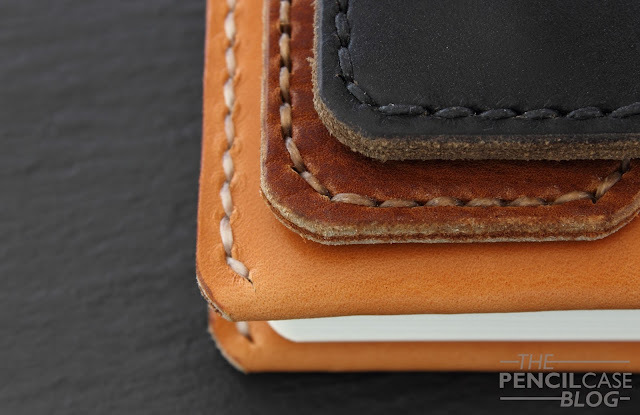 The most popular probably being the Park Sloper Wallet, a compact wallet cover that holds a Field Notes (or similar) notebook, some cards and a thin pen. I'm personally not much of a pocket notebook user, but I do tend to carry my Leuchtturm A5 hardcover with me for doodles, testing pens and writing nonsense, so it made sense to go for a cover that fits these notebooks instead. I'm definitely a minimalist when it comes to my pens and accessories, so I mentioned that to Keegan and he delivered his most simple cover style: the 'Wrap style' Leuchtturm A5 cover. The cover is a single piece of leather wrapped around the edges on the long side, and stitched on top and bottom. If you prefer a bit more practicality and function, you can also opt for the 'Full stitched' option, which is stitched all around the edges. 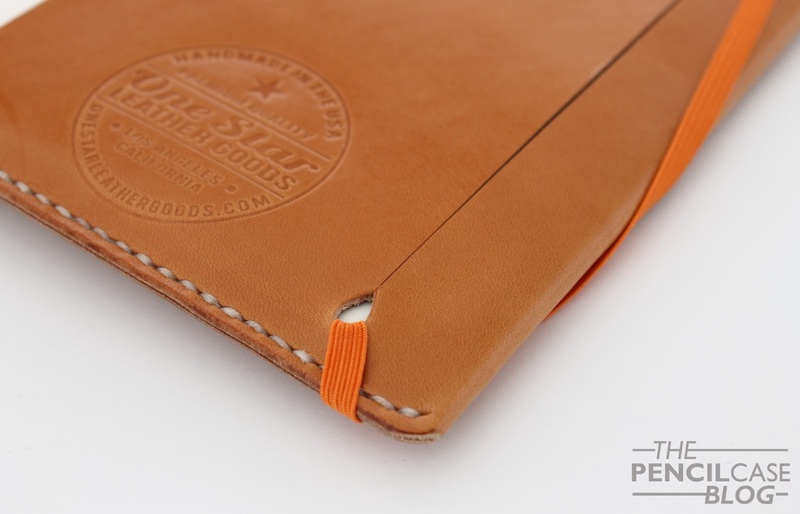 The full stitched version allows additional options, such as a pen loop and/or card slots on the inside of the cover. But as I said, I personally prefer the more minimalist aesthetic. I have to give them credits to the design, because it's so simple yet elegant and very comfortable to use. The wrapped edges are smooth, pleasant to hold and carry around (burnished edges always feel a bit rough) The edges do bulge a little bit because it's actually a folded piece of leather so it won't want to completely flatten out (although it does take on the shape of the notebook more after prolonged use). All branding is done on the inside flaps of the cover, so from the outside it retains its' clean look. I especially like the small star logo on the bottom left hand corner. The leather I chose for the cover is called 'Tan'. It's an undyed leather that is lightly treated with leather balm to preserve and protect it. The leather has a very natural look and feel to it. You can see it's a high-quality skin, because there aren't any blemishes or scars in it. Build quality is excellent. The stitching is straight and even, and done with a sturdy waxed thread. 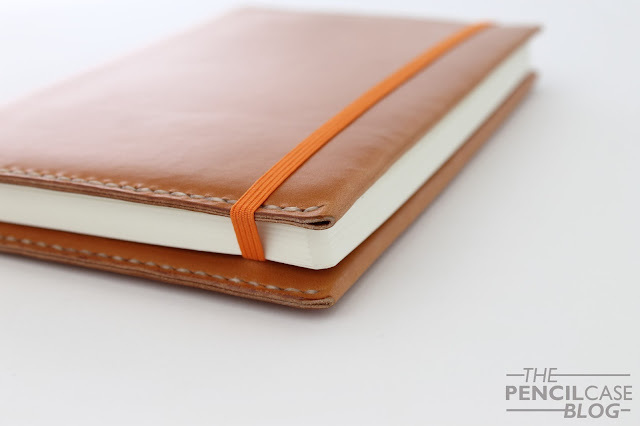 The particular leather that was used here is thin but not flimsy, so it doesn't add too much bulk to your notebook. In terms of build quality, Keegan and his team certainly didn't disappoint. Everything is handmade (even the stitching is done by hand!). It's clear that they know their craft: the cuts and stitches are straight and even. And the edges are rounded off and burnished lightly. 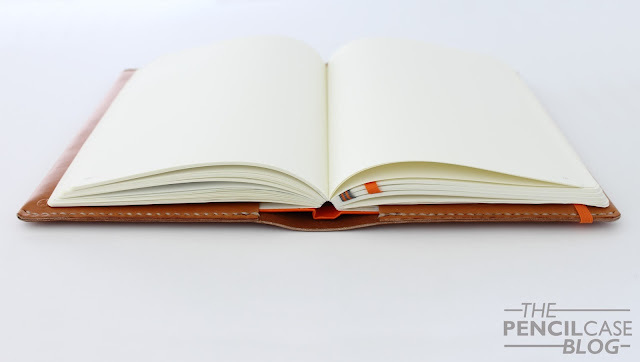 The cover -as configured here- doesn't have a built-in elastic closure, instead it makes use of the elastic band of the Leuchtturm notebook. The cutout slit on the inside of the cover allows the elastic to fit through so it can still be used with the notebook fit inside the cover. Because of this, the color of the notebook you use, will affect the look of your setup with a touch of color! The pen sleeves follow the same minimalist look as the cover. The elegance lies in its' simplicity here. 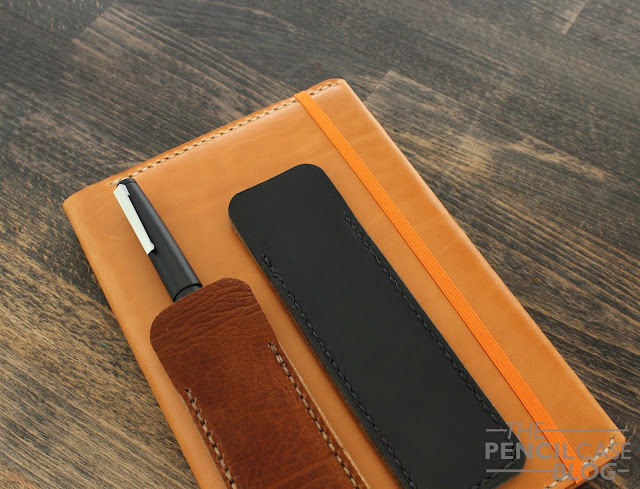 Pen sleeves like these are a simple means of protecting your pen, but an effective one at that! The sleeves are made out of two pieces of leather, stitched all the way around. 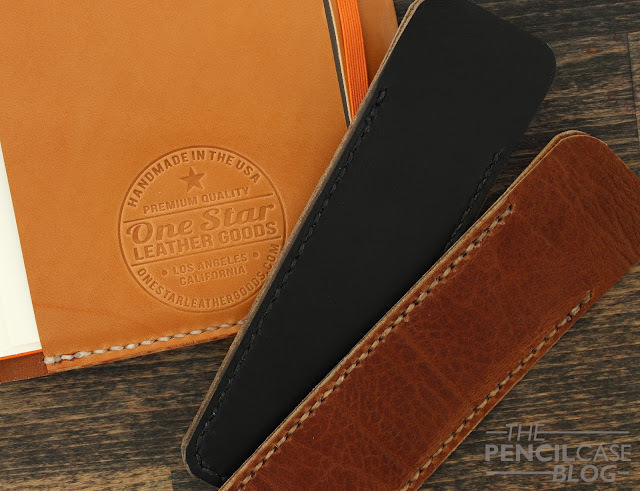 I've seen pen sleeves from One Star that were made out of a single folded piece, but I suppose this was either the old style, or something they change up randomly to keep things interesting? I think both look good, but I'm pretty sure if you prefer one or the other, you can just ask them when you order. There's definitely a sense of customizability possible if you get in touch with them, which is nice. The pen sleeves are available in three sizes: one made specifically to fit Kaweco Sport pens, Medium (fits pens up to 14cm/ 5.5" long and diameter up to 12mm) and Large (fits pens up to 15cm/ 5.9" and diameter of 17.5mm). 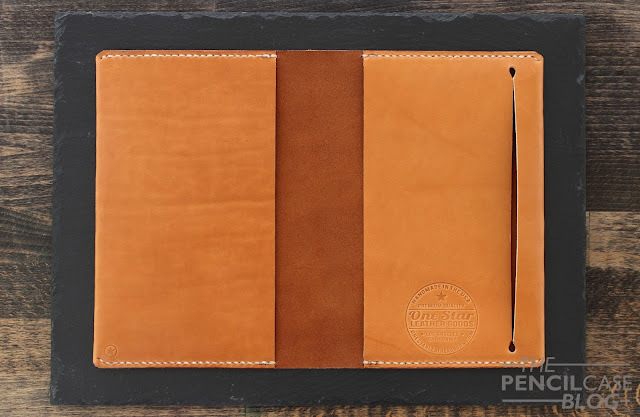 A double pen sleeve is also available, and the slot size is intermediate between the Medium and Large. I received two Large sleeves made from Horween leather, one black and one 'Rough tan'. 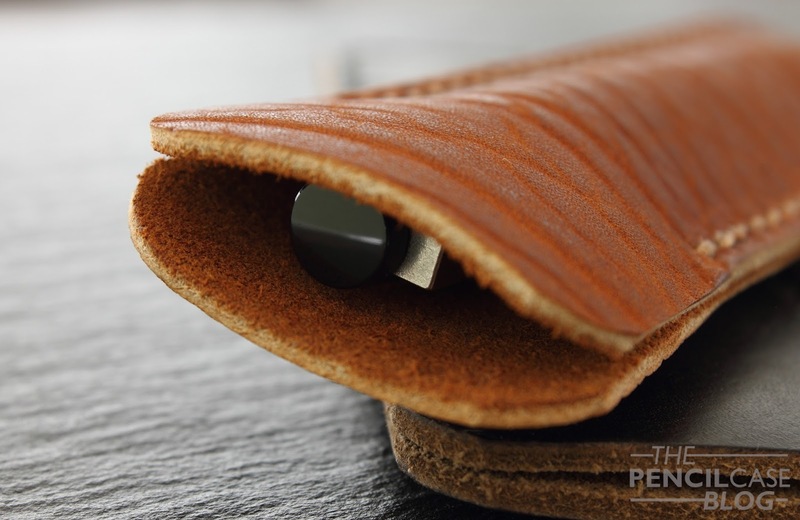 The leather is untreated on the inside so it doesn't harm your pens. The sleeve is rather tight at first, especially for larger pens, but it does stretch with time (although it still remains a relatively snug fit). It's safe to say that One Star lived up to my high expectations! The quality is top notch, you get the choice of various leather styles, and there's a certain degree of customization possible. On top of that, prices are quite reasonable -especially given these are fully handmade in the USA. The A5 notebook cover starts at 70$ for the simple 'Wrap style', and goes up from there depending on the options. The pen sleeves cost between 25$ for the Kaweco-sized and 40$ for the large double sleeve (35$ for the medium and large single sleeves as seen here). 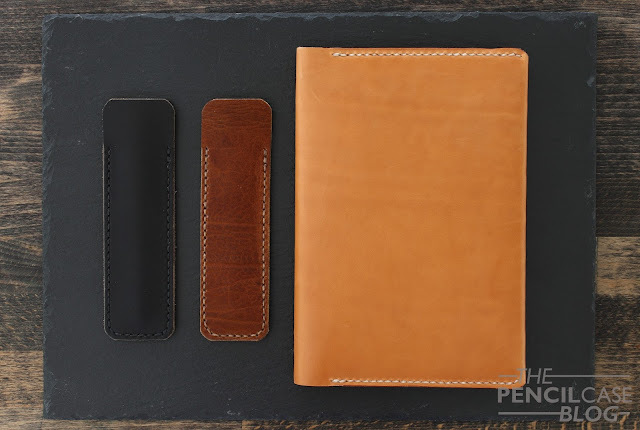 Note: These products were provided by One Star Leather Goods, free of charge, so I could write this review. I was in no way influenced in the making of this review, the opinions shared in this review are completely my own! This post does not contain affilate links.